(CNN) -- World number four Andy Murray continued his comeback from illness by easing into the fourth round of the Indian Wells Masters with a comfortable straight sets victory over Paul-Henri Mathieu. Murray dropped just five games as he reached the last 16 in Indian Wells on Monday. The 21-year-old Briton saw off the French 32nd seed 6-3 6-2 in only his second singles match since withdrawing from the Dubai Open quarterfinals last month with a virus. Murray has played down his chances of claiming the title, but he showed signs he is returning to top form against an erratic Mathieu. "It was very good apart from a couple of games," Murray told PA Sport. "The one where I got broken in the first set was disappointing. "I had a couple of sloppy points and lost concentration a little bit. But I'm hitting the ball well and it was much better than the first match against Albert Montanes." 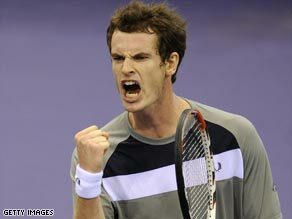 Murray needed little more than an hour to complete victory and will now face either Spain's Tommy Robredo. The Scot remains on course for a potential semifinal showdown with Roger Federer after the Swiss second seed and world No. 2 eased past Croatian Ivo Karlovic 7-6 6-3 to set up a last 16 clash with Chile's Fernando Gonzalez. Eighth-seeded Frenchman Gilles Simon was the biggest casualty of the day, beaten 6-3 7-6 by Croatia's Ivan Ljubicic, while 10th-seeded Spaniard Fernando Verdasco beat France's Richard Gasquet 6-3 6-2.